Sign up for our monthly newsletter R4D Insights to get the latest tools, resources, and news in global development. In 2017, the World Bank, R4D and 1000 Days created the Investment Framework for Nutrition as a roadmap towards achieving the World Health Assembly (WHA) nutrition targets by 2025. The framework estimates that the world needs to mobilize an annual additional investment of $7 billion per year to scale-up nutrition-specific interventions at the level needed to achieve the global targets. In the materials below, R4D builds on prior work on the Investment Framework for Nutrition to track whether donor support will be sufficient to meet the financial targets it lays out. The materials provide information on nutrition-specific donor disbursements to the WHA nutrition targets in 2015 and 2016. With this work, R4D aims to advance the nutrition community’s collective understanding of the financing landscape for nutrition from donors, government focal points, civil society organizations, advocates, and other members of the Scaling Up Nutrition (SUN) Movement. These materials expand on previous work to track donor support for nutrition, including Action Against Hunger’s Aid for Nutrition series, which has been used to support advocacy and resource mobilization for nutrition. By adding WHA target and intervention information to tracking donor support, the community is better able to monitor progress towards the global goals. Please contact Mary D’Alimonte for any questions or comments on these materials. 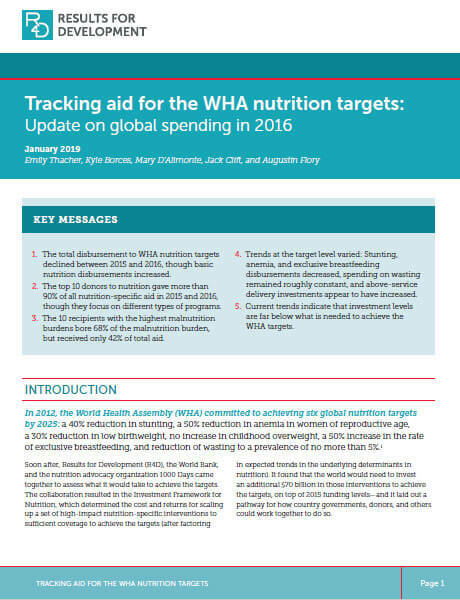 Building on the previously published analysis of 2015 donor disbursements, the report “Tracking Aid for the WHA nutrition Targets: Update on global spending in 2016” provides new findings on 2016 disbursements. It notes a concerning trend in donor aid for the package of high-impact interventions described in the Investment Framework that are critical to achieving the WHA targets: not only are disbursements not on track to meet the investment benchmarks, donor aid to these interventions has actually declined. The report also explores the top nutrition donors, the relationship between burden of malnutrition and aid received for recipient countries, and trends by WHA target. This 2-page profile provides an overview of 2015 and 2016 donor disbursements, illustrating donor aid for high-impact nutrition interventions by target, intervention, donor, recipient, sector, and more. The 2016 update to supplementary material amends the full study methodology with details specific to the 2016 analysis. For a complete discussion of the study methods, please refer to the 2015 report and supplementary materials (below). * Please note that due to ongoing methodological improvements, disbursement values from the 2015 analysis have been updated to ensure consistency with 2016 figures in the 2015-16 analysis. This may lead to slight discrepancies between 2015 values presented in 2015 and 2016 materials. The report “Tracking aid for the WHA nutrition targets: Global spending in 2015 and a roadmap to better data” provides data and graphics on donor disbursements to the WHA nutrition targets in 2015 by sector, recipient country, donor, channel through which funding flows (e.g., whether aid is channeled through UN Institutions, non-governmental organizations, public sector, etc.) and by WHA target. While investments in the enabling environment and nutrition-sensitive activities are critical to achieve the WHA targets, disbursement data is currently unavailable. This 2-page profile provides an overview of 2015 donor disbursements, illustrating many of the findings discussed in the main report. The policy brief summarizes three recommendations made to the SUN Donor Network to improve data availability and reporting on donor disbursements for nutrition. The supplementary material to the main report includes several appendices that expand on the methodology, provide additional detail on disbursements by purpose code and recipient, and illustrate the flow of funds from donors, through channels, and to interventions.